Warren Buffet is known for saying that every successful billionaire has at least seven streams of income. We all know it makes sense, you never put all your eggs in one basket… sticky yolky mess not necessary! So how do you do it and how do you juggle it? By creating businesses that run themselves. You want to make the most money by expending the least effort. Don’t be a martyr, we all want to be on the beach with a daiquiri whilst the pennies come rolling in! If you currently only have one business, product or service, you firstly need to look at what else you can offer to generate additional income, ideally passive income. The most obvious way to do this is through information marketing. Information marketing is basically ‘you’ translating your personal genius and wisdom into a consumable format so others can learn from your expertise. It’s an information product. You are an expert in something, likely whatever it is you are making, doing, selling, or offering. You have created a path, or a formula, to get to where you are today in order to create your success and there is a market of people who would love to learn how you did it so they can replicate it. And better yet they will pay! There are courses out there on how to write your own online courses, believe me, (info marketing on steroids), but if you’ve ever taken an online course you’ll have an idea of how to structure your own. Udemy.com is a great place to start if you want to keep it simple. Once you have an online course established and generating passive income, you can look at ways to leverage this content. Could you offer personal coaching? Consulting to other businesses? Could your knowledge and ‘information’ be turned into a book? Consider teleseminars, webinars, membership strategies and the ‘done for you’ model where you do for others what you’ve already achieved for yourself. These are all additional revenue streams you can add to your business portfolio. Another way to increase your revenue streams is to look at your traffic channels, particularly if you’re in a product-based business. Are you just selling direct from your website? If so have you considered setting up an Amazon online shop, an ebay online shop, even a Facebook shop? If traffic to your website ever stopped, (god forbid), you’d still have eggs, and subsequently revenue, coming in from other channels. The same applies to our advertising. Are you just advertising on Facebook or Google? Have you explored Twitter, LinkedIn, Youtube ads or even affiliate options? 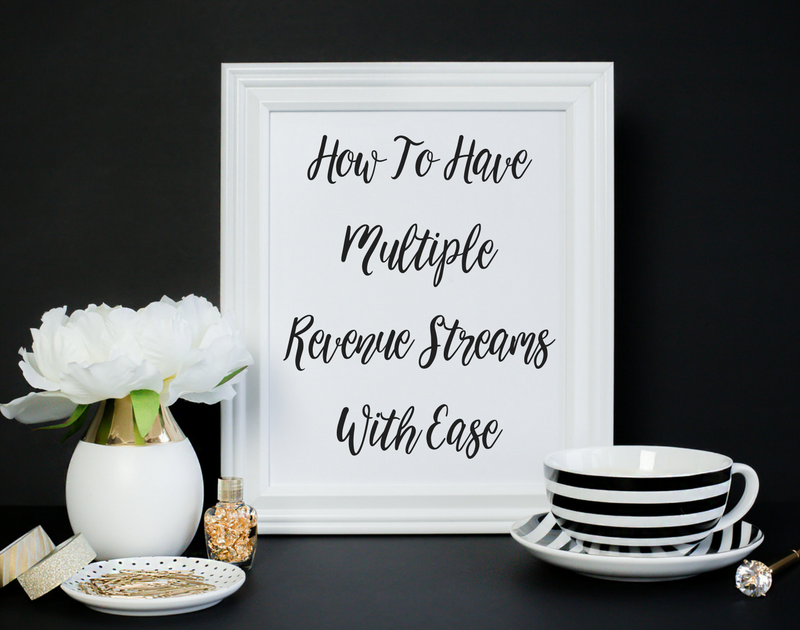 Of course the most obvious way to have several revenue streams is to have several businesses. Consider what other niches you could expand into? If you already have a client base for your existing product or service, could you expand into complimentary products and services, or can you identify another offering for the demographic you currently serve? Whilst setting up lots of companies can be very exciting and certainly feel like you are growing and expanding, be careful to make sure you’re not taking on too much. I juggle six businesses but I do so with the wonderful power of automation. Almost every aspect of every business is taken care of by robots. I even have a virtual agent customer service bot for our ‘out of hours’ so I never miss an enquiry. I also have a huge team of staff, without whom it would be impossible to manage so many revenue streams. There are some things even a robot can’t do! Management of revenue streams is just as important as the creation of them. If systems aren’t in place to manage the influx of enquiries, sales and service then you will inevitably struggle, if not fail. Passive income is a brilliant source of income if your automation is concrete. Once you’ve created your content, set up online marketing systems, revenue collection and automated book keeping, you can make money in your sleep whilst never having to lift a finger to that particular revenue stream again (bot glitches aside of course). Creating a passive income stream is also a genius way to raise the necessary funds into the next business (service or product), which may demand more of your time, energy and active involvement. Cautions aside, the sky is the limit. Anything is possible so go for it!